From the moment I was submerged under water and the world beneath the sea became visible through my goggles, I knew I would be scuba diving forever. If you’re looking for a new hobby to take your mind off politics, the stresses of the world and day-to-day life, then you’ll probably LOVE scuba diving. It’s basically like snorkeling but with so much more freedom to explore a world usually only accessible through documentaries and pixar films. There are a few things to consider when looking for a place to get your Open Water certification. In my opinion, it can be broken down to safety, price, and type of certification (PADI vs. SSI). After extensive research, I chose to get my SSI certification through Phoenix Divers Koh Tao. They are a relatively small diving operation on the beautiful Sairee beach on Koh Tao Island in Thailand. One of the cheapest places in the world to become a certified diver! They have small class sizes (no larger than 5 people per group), affordable rates, quality equipment, comfortable accommodation, good food, and finally knowledgeable and experienced instructors. I chose SSI over PADI, simply because when all things are considered they are both internationally recognized and almost interchangeable but SSI is cheaper because you “rent” your training book instead of purchasing it. 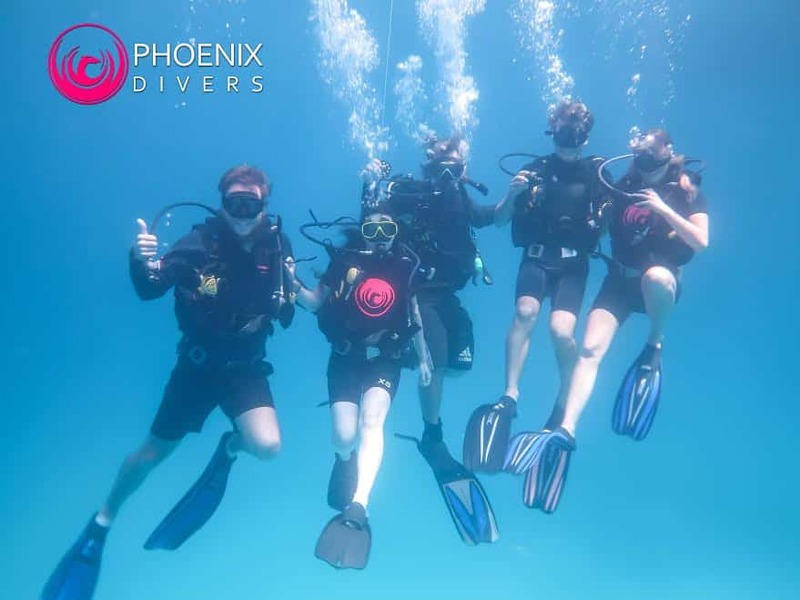 I quickly became addicted and didn’t want to be limited to only diving to 18 meters, so I continued my training with Phoenix Divers and got my 2-day Advanced Adventurer Certification for $204 USD. There is a 10% discount after doing the Open Water Certification with the same company, so I only paid 7,020 TBH out of the original cost of 7,800 TBH. If you are interested in picking up diving as a hobby, I highly recommend getting your advance certificate because it allows you to do night dives, deep dives up to 99ft, and shipwreck dives if you are so inclined. They also teach you how to use a diving computer, navigate with a compass, and get a handle on your buoyancy through fun underwater obstacle courses. So all and all your dives will become more comfortable and relaxed the more you know and the more dives you get under your belt. No matter where you choose to scuba dive though, you should always make sure you get yourself covered with travel insurance. I like World Nomads because they cover adventure activities like Scuba Diving. I had a $115 hospital bill in Thailand from an ear injury while scuba diving that World Nomads 100% reimbursed. I typically use Skyscanner to book my flights because it allows you to search through websites and airlines worldwide all in one convenient search engine. You can also get price alerts for flights you’re interested in.Compare prices on flights with Skyscanner. I always book my hostels through Hostelworld. If I’m not staying in a hostel, then I book an AirBnB. I always travel with insurance, because I know all too well how many things can go wrong while traveling (and sometimes even beforehand). Travel insurance protects you against certain cancellations, theft, medical emergencies, and more. I have been using World Nomads for the last seven years, and they haven’t disappointed me yet. Check out my Travel Resources Page to see the best companies, apps, jobs and other resources I use when traveling on a tight budget.